A few DEM Blogs ago, we wrote about spring being a Season of Preparedness (Tis the Season for Spring Preparedness). With the Christchurch, New Zealand Earthquake anniversary; the Tohoku, Japan Earthquake and Tsunami anniversary; Tsunami Preparedness Awareness week; and, the 1906 San Francisco Earthquake and Fire anniversary there are numerous reasons to highlight emergency preparedness in spring. 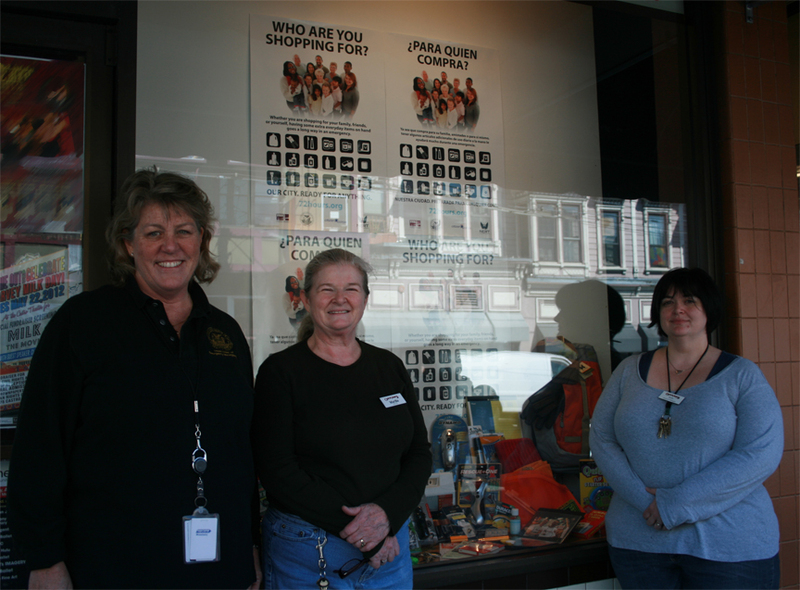 In support of this Season of Preparedness, we wanted to leverage the heightened public awareness brought about by the 1906 San Francisco Earthquake and Fire anniversary to promote household preparedness. And thus the “Who are You Shopping For?” emergency supply shopping campaign was born. From left to right, DEM Executive Director Anne Kronenberg pictured with Martha Asten and Terry Asten Bennett of Cliff’s Variety Store. 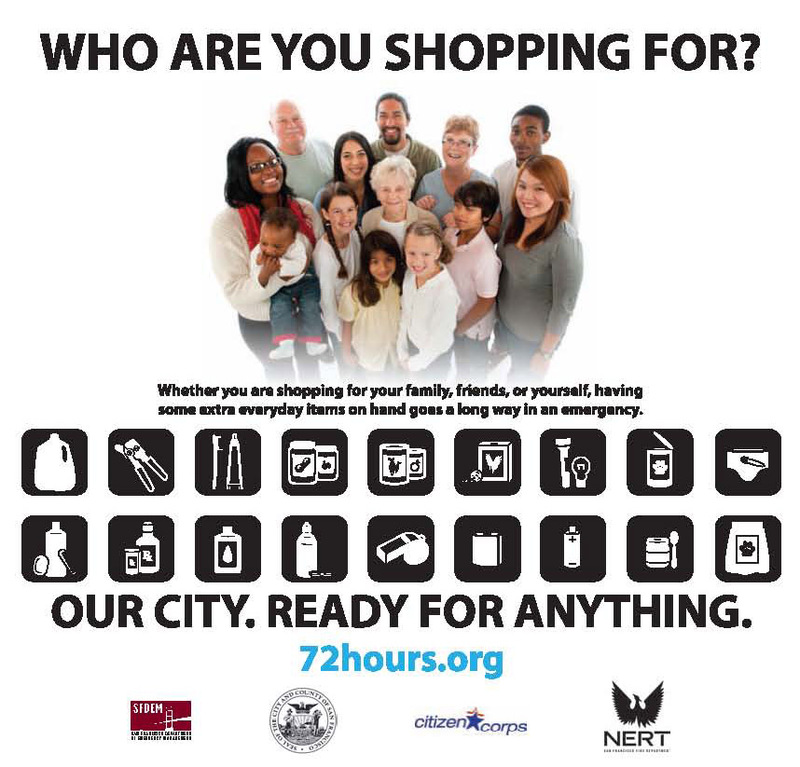 The “Who Are You Shopping For?” campaign kicked off April 16th and runs through April 30th and its goal is to increase awareness of what household items should be on hand during an emergency. 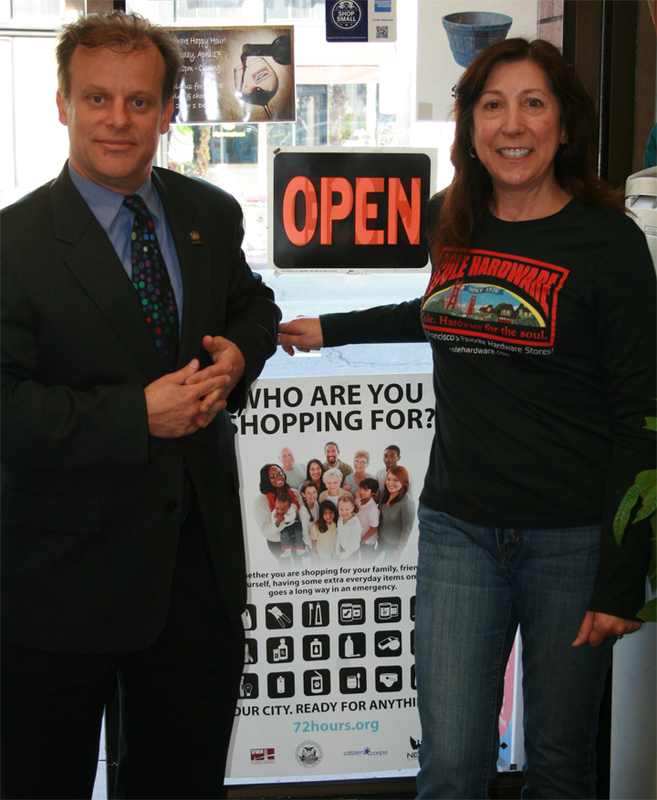 The campaign targets the general San Francisco public and consists of signage displayed at local retailers, including Cliff’s Variety, Cole Hardware, Haji’s Hardware, Speedy’s Hardware, and Walgreens. We also created a post-card-sized comprehensive emergency supplies shopping list that also includes an “Events at a Glance” section listing community preparedness events taking place this spring. The reason why we are calling this campaign “Who Are You Shopping For?” is because we frame our emergency preparedness messages around what people value to inspire emergency preparedness behavior. “Who Are You Shopping For?” is a question directed to those shopping for their household, which can include just about anyone (e.g., parents; children of aging parents; friends shopping for friends; or people who live alone and shopping only for themselves). Our goal is to motivate San Franciscans to purchase a few extra everyday household items that would be important to have on hand after an emergency or disaster. 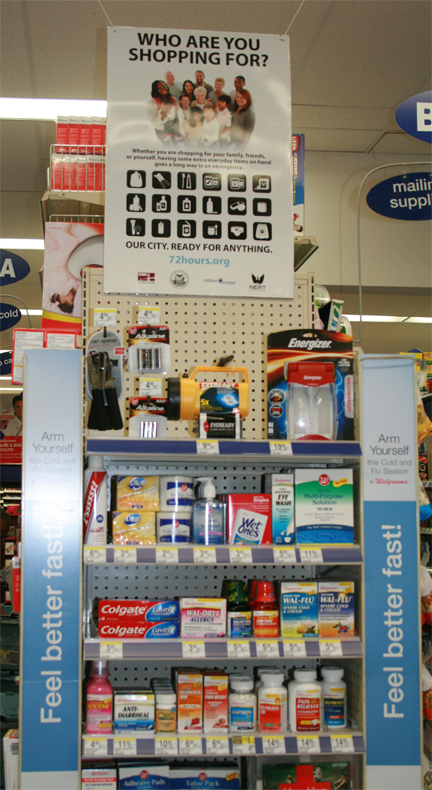 Walgreen’s in-store “Who Are You Shopping For?” emergency supplies display. The campaign also delivers DEM’s core preparedness message: you are more prepared than you think; a message intended to dispel the feeling of inadequacy often associated with emergency preparedness. It is also a message we firmly believe is true for ALL of us and one that is important to spread because it gets the ball rolling, so to speak, when we realize we already have many resources in place that support our emergency preparedness. The 45th Cherry Blossom Festival is taking place this weekend in San Francisco’s Japantown. What great way to spend the weekend and enjoy one of San Francisco’s most beautiful neighborhoods. This year’s festival will celebrate the 100th year anniversary of the National Cherry Blossom Festival in Washington, D.C. and will also pay tribute to the 100th Infantry Battalion, the 442nd Regimental Combat Team and the Military Intelligence Service comprised of all Japanese American soldiers receiving the Congressional Gold Medal of Honor. 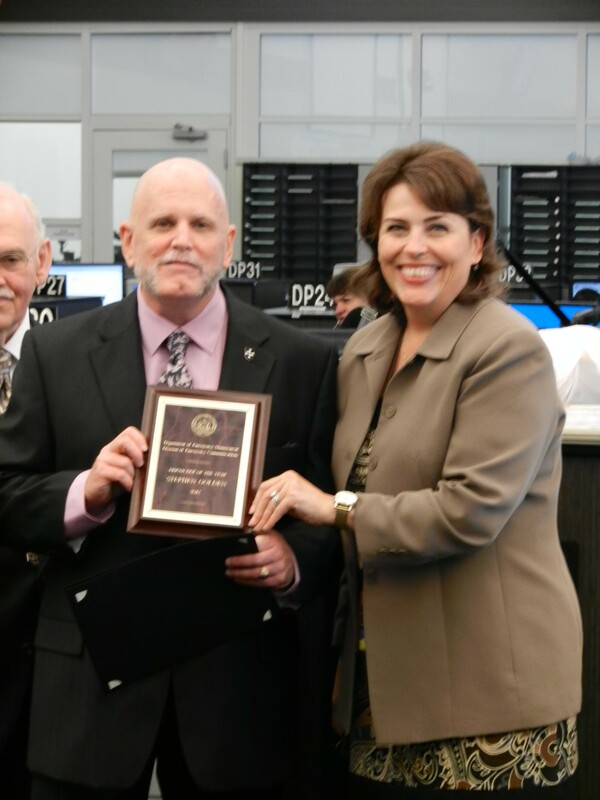 The highest civilian honor bestowed by the U. S. Congress. The festival will also recognize the one year anniversary of the Tohoku Region Earthquake and Tsunasmi. Grand Parade: Sunday, April 22, 2012, Starting at City Hall at 1 pm, north on Polk, west on Post, concludes in Japantown at approxismately 3 pm. While you are there look for the Girlscouts Troop that will be distributing emergency preparedness kits. We are very proud of the troop for meeting with us to learn about emergency preparedness and spreading the message of preparedness and resilience! We close this DEM Blog post with Person on the Street interviews about preparedness in Japantown; we love this neighborhood! This photograph by Arnold Genthe shows Sacramento Street and approaching fire (from Steinbrugge Collection of the UC Berkeley Earthquake Engineering Research Center). My good friend, the City’s Asbestos Control Manager, warned me that the room was a serious hazard. Asbestos-filled pipe insulation hung in shreds from the ceiling. The removal method was complete destruction of everything in the room by dumping the documents into a water barrel. I only had this evening to act! I put on a pair of disposable hospital scrubs and a surgical mask, and went in. No one else was working in the building. 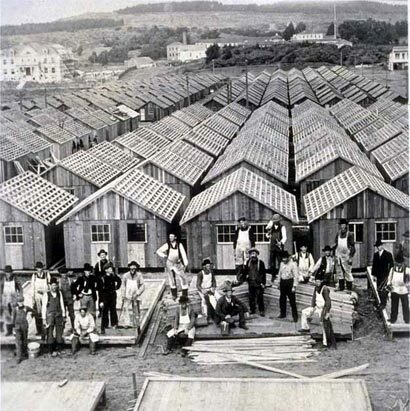 In the far corner of the room on the lowest shelf – there they were – bound ledgers labeled, “Pay Roll Log, 1906-1907.” These logs began in May, 1906, and listed the DPH employees working in 16 of the 26 camps set up around the City to house residents of San Francisco displaced by the quake and fire. DPH selected these 16 camps to establish daily medical clinics of various sizes with the following types of staff: surgeons, nurses, horse-and-wagon teamsters, foremen and laborers, pharmacists and night watchmen. 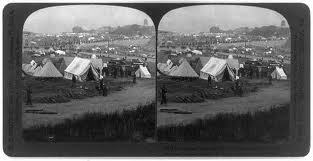 San Francisco Earthquake of 1906: Jefferson Square camp (circa April 1906). Picture courtesy of the National Archives and Records Administration. In August, 1906, emergency sanitary surgeons were added at a salary of $100 per month. It is likely that these personnel were closer to the modern health inspector. By January, 1907, camp surgeons were added at $150 per month. Because of infectious disease issues, such as the plague, the role of assistant bacteriologist was added in September, 1907. These camps operated until the last one closed on June 30, 1908. Camps set up in Fort Mason. These logs were in handwritten cursive using India ink. The penmanship was perfect. Adjacent to these logs were the Board of Health minutes from May, 1906, through 1912. I gingerly placed approximately 15 of these books in a cardboard box and sealed it. I called Dave Rizzolo, the Asbestos Manager, the next day to confess my crimes and beg forgiveness. He graciously agreed and arranged for the asbestos contractor to carefully remove the asbestos from all the volumes. I then notified the City Archivist at the San Francisco Main Library, Susan Goldstein, who was absolutely thrilled. She said that they knew about the camps, but not about the exact work of the Health Department. They remain in a temperature-controlled room at the San Francisco Main Library in perpetuity. It felt good to fill another hole in the history of the 1906 Earthquake and Fire, and to illuminate the fine work of a group of dedicated civil servants. We conclude this DEM Blog with a prevention and preparedness message: though earthquakes are unavoidable, fires can be extinguished in the beginning stages. Having a fire extinguisher on hand (and knowing how to use it) will be vital to San Francisco’s ability to mitigate the vast and significant damage San Francisco experienced in April 1906. Becoming a trained member of San Francisco NERT is a great way to know what to do before and after a disaster, including but not limited to how to put out fires, provide first aide, and conduct light search and rescue. And establishing your household’s emergency plan and having extra supplies on hand will not only help you recover from a disaster, but the entire City and County of San Francisco. Visit 72hours.org to learn more about how to be prepared for just about any emergency. Temporary housing/shacks built in the Richmond District. 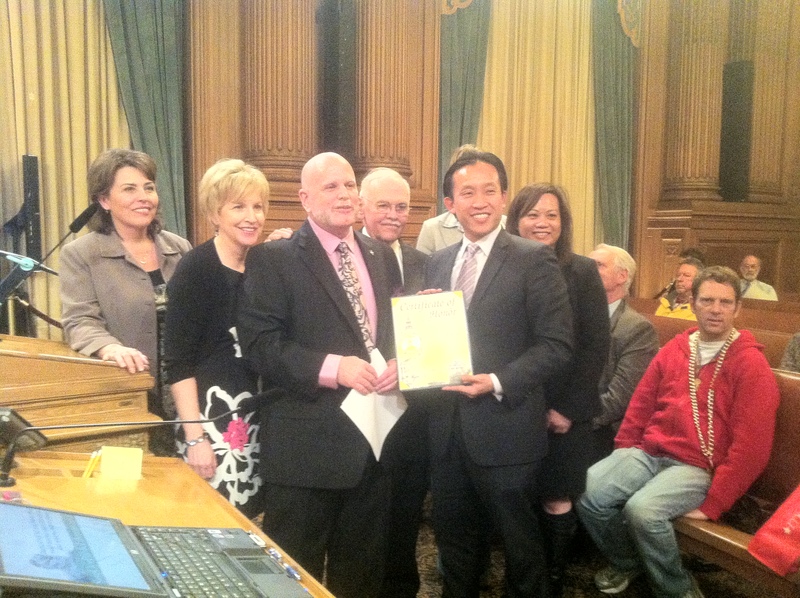 Stephen accepting his commendation presented by SF Board of Supervisors President, David Chiu. 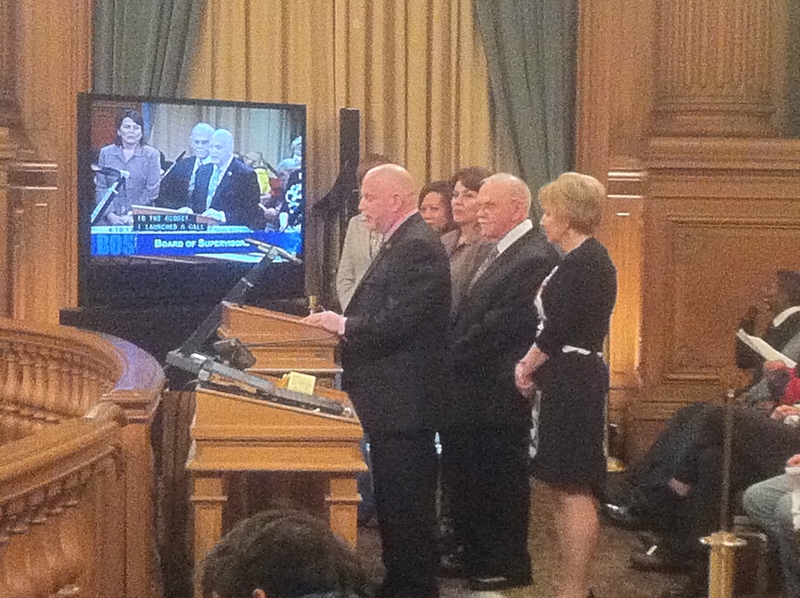 Stephen sharing his account of the 9-1-1 call to the SF Board of Supervisors. 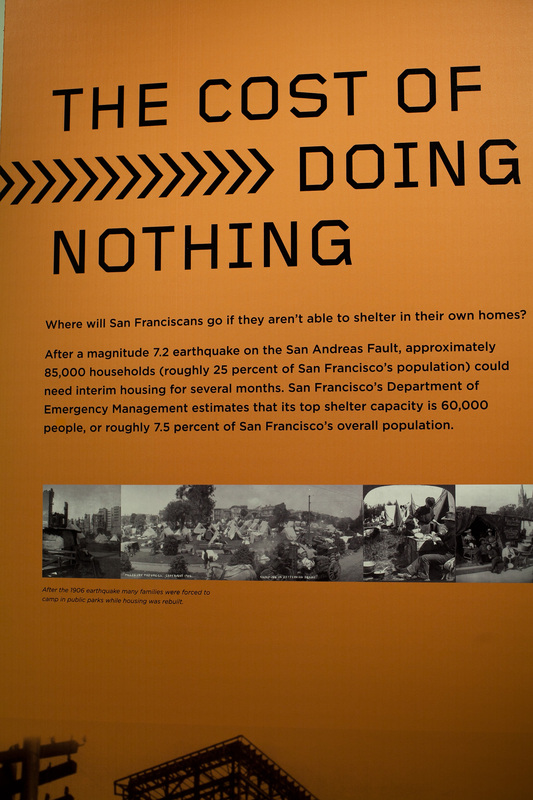 The goal of the exhibit is to help visitors of the exhibit visualize themselves staying at home after an earthquake (as opposed to leaving their homes and going to a shelter); plan the tasks needed to make our homes safe enough to stay; and inspire visitors of the exhibit to conduct and complete these tasks—therefore making our homes safe enough to stay a reality. 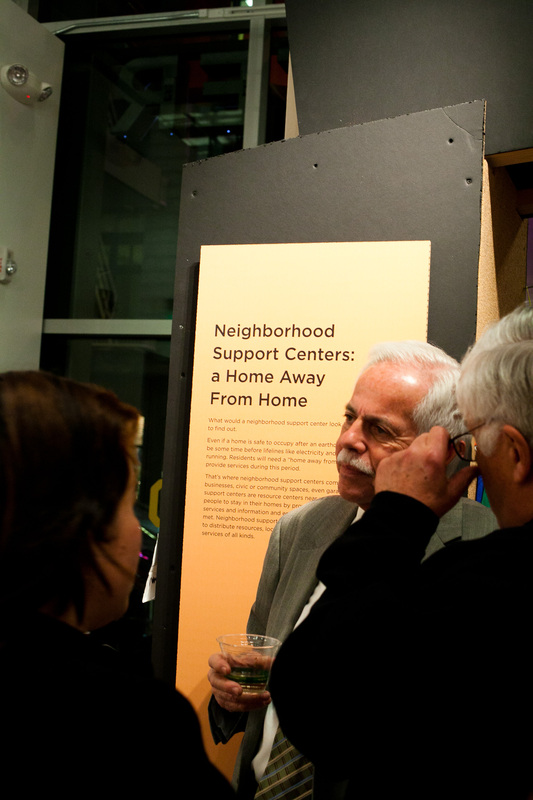 For those of us who may not be able to visit the exhibit in person, take a video recorded visual tour of the exhibit with the Neighborhood Empowerment Network (NEN) Director Daniel Homsey and Laurence Kornfield, Program Manager for the Community Action Plan for Seismic Safety with the City and County of San Francisco General Services Agency and under whose leadership Safe Enough to Stay was created. 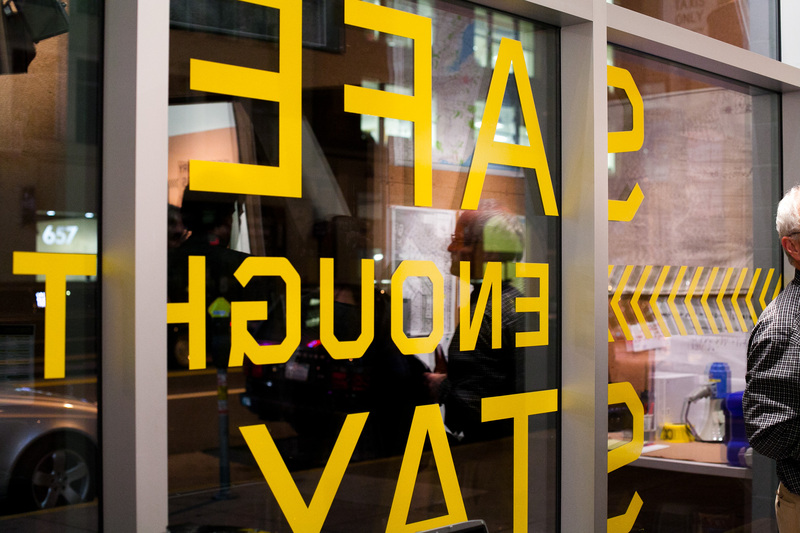 Thanks to NEN for capturing the Safe Enough to Stay exhibit for posterity!